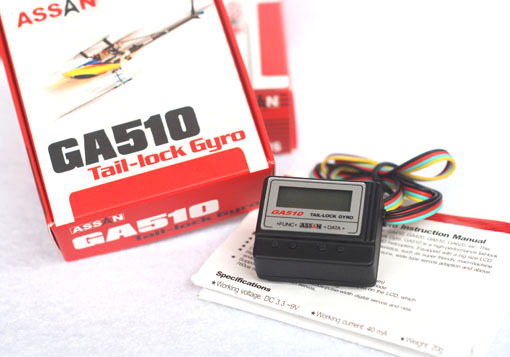 GA510 is a high-performance tail-lock gyro specially optimized and designed for RC 3D helicopters. Equipped with a big size LCD display, it's also with some outstanding characteristics, such as super friendly man-machine interface, practical useful default/programable functions, wide type servos adaption and above all it's with good tail-lock performance.  Big size LCD display: the working status displayed on the LCD, which enables the setting all visually and easily.  Support multiple tail servos: 1520us-pulse-width digital servos and new 760us narrow pulse-width servos.